The Cowboy Lake trail is located in the Mountain Division of the Uncompahgre National Forest east of Montrose, Colorado. 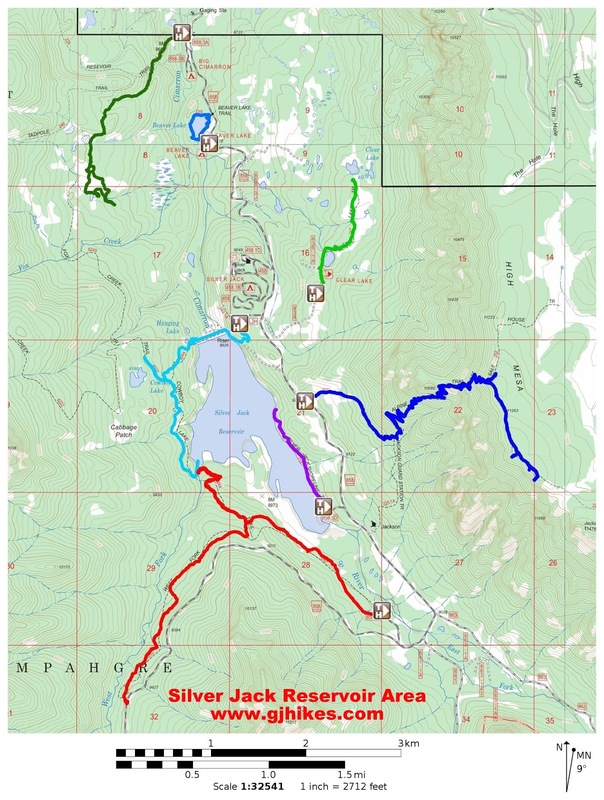 The trail begins at the Silver Jack Overlook where it descends the hillside to the lake, crosses the dam, and continues around the west side of the reservoir following both single and double track trails until it comes to an end at the West Fork trail. Views of the mountains surrounding the upper Cimarron River Valley can be breath taking. To get to the trailhead drive east on Highway 50 from Montrose for 20.5 miles and turn right on the Cimarron Road. Follow this road for about 17.2 miles to the Silver Jack Overlook sign in this picture. 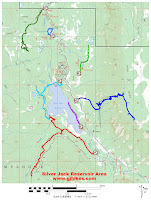 The forest boundary and the Big Cimarron Campground are located after 15 miles with the Beaver Lake Campground a mile later and the Silver Jack Campground a mile after that. Begin by following the wheelchair accessible trail from the parking area that leads past the restroom to the Silver Jack Overlook. Afternoon thunderstorms are common in the mountains so consider taking your rain gear even when there are no clouds in sight when you leave the trailhead. Continue past the overlook where the trail turns to dirt and walk through the fence. The easiest route from here is the trail that gradually descends the mountain. Another trail that is somewhat steep and precarious follows the fence line. When the trail reaches the road follow it to the right and continue across the dam. The view of the mountains from the dam is incredible. If you hiked no further than this you would probably leave with no complaints. Pick the trail up again after crossing the dam. The trail begins climbing the mountain just west of a fenced off area that is closed to the public. The single track section of trail between the dam and the double track can be hard to follow due to lack of use and fallen trees. 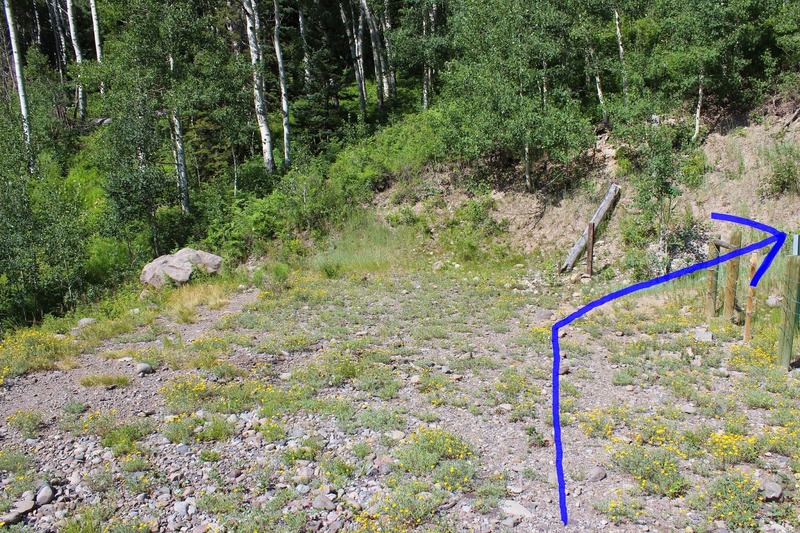 Good sections of trail like that in this picture and a few logs that have been cut in past years are just enough to help a careful hiker follow the correct route. If you managed to stay on the trail you will come to this small cairn. This is a key point to remember for the return trip. The single track trail ends just over 1 mile from the trailhead. A few yards down the double track and you should see this trail sign on the right side of the road. The double track isn't flat but it is still a lot faster to hike. 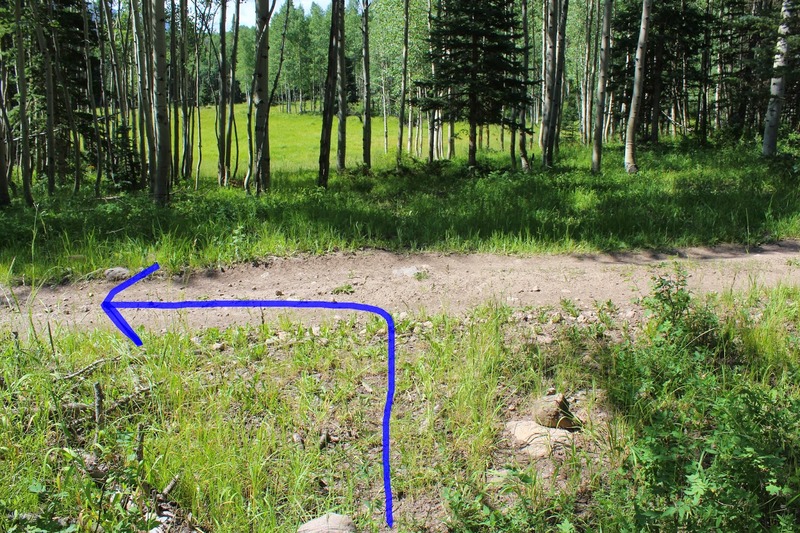 This part of the trail is open to ATVs and dirt bikes. At the 2 mile point of the hike the trail drops back down to the level of the reservoir and crosses the West Fork of the Cimarron River. The water is shallower where the creek fans out before entering the reservoir making it a better place to cross the creek. 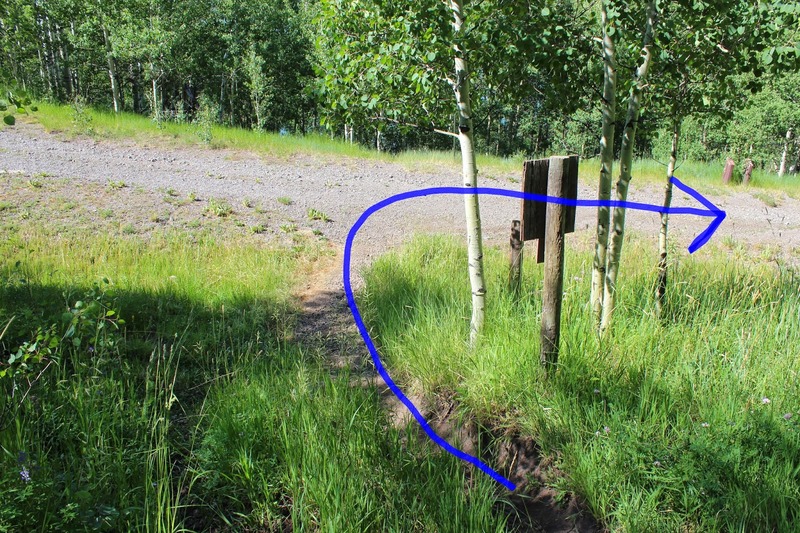 This is also the only place along the western portion of the trail where there is access to the lake for fishing. After another 3/4 of a mile the Cowboy Lake trail comes to an end where it meets the West Fork trail. The overall elevation gain on this hike is over 600 feet. We stirred up a herd of cow and calf elk while hiking that disappeared in the trees before we could get a picture. This doe was bedded down near the trail. She stood up for a couple of quick pictures without ever running away. At this point you may be wondering what happened to Cowboy Lake. After all this is the Cowboy Lake trail. 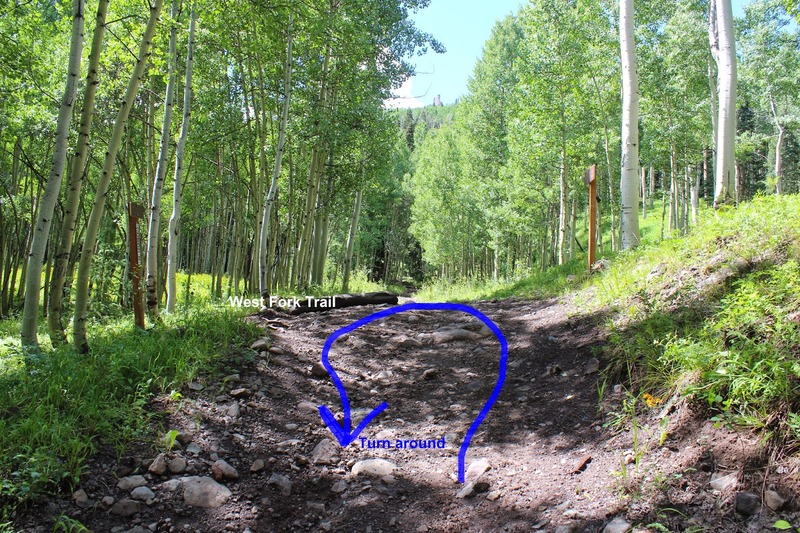 If you study the map you will see that the closest the trail comes to it is where the single and double track trails intersect. We actually hiked along the road in that direction without ever finding a place where we could see Cowboy Lake. There are still plenty of other sights to see along the way. Be careful finding your way on the single track section of the trail on the west side of the reservoir. A GPS and a good map are recommended for this hike. If you would like to see it for yourself then all you have to do is 'Take a hike'.